White Dock, folders and background. To make both Home Screen and Lock Screen white, select "Set Both." If both are pure white, the wallpaper of Home Screen will be changed to that of Lock Screen, even if the size and the margin part due to the Parallax Effect are different (Lock Screen takes precedence). For folder name, copy the empty letter. ​You can make the white blank icon. Add this page to Home Screen. a ​shadow appears on top of it. Normally Dock and folders will be gray if you use pure white wallpaper with the iPhone. However, when the color is added to some extent and the brightness of the wallpaper drops, they become brighter, and the white part of the background can not become brighter anymore, it becomes the same color and disappears. 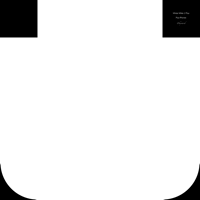 ​When setting wallpaper with "Perspective", the judgment of brightness includes outside of the display (only in the visible range in the case of "Still"). The wallpapers on this page put the black parts in the invisible place to whiten the whole surface. If this is too narrow, Dock and folders will remain gray. But if it gets too wide, black may appear on the screen when you tilt the iPhone, and Dock and folders, pick up colors from a distance, so black must be just the right area. Dock processing changes in iOS 11.2 The borderline of the wallpaper has been changed. It is necessary to increase black more than before. On iPhone X, I hid black using notches. The bottom parts are not very effective (emphasis is put on the upper one in the brightness judgment of the wallpaper) Since the shadow appears in the dock when it is tilted it has been removed. In Plus iOS 11 now the whole square wallpaper is measured. Since black can be placed in the four corners that become blind spots either in the vertical position or in the horizontal position, layout with plenty of margin is possible. 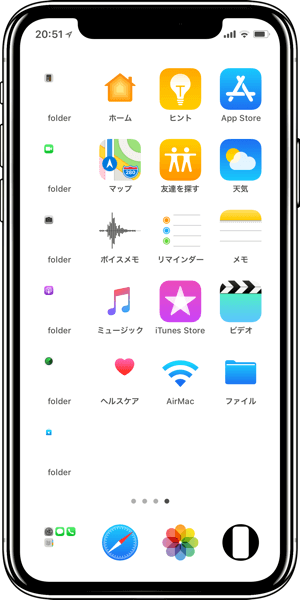 ​Unfortunately, other iPhones can not prevent shadows from appearing on top folders. The wallpaper for "8/7/6s/6/SE/5s, iOS 11.2 -" can be used with other iPhones or earlier iOS (except some) if you want to use it. However, shadows appear in folders and they are easy to protrude. ​In iOS 11.3, setting the wallpaper from portrait/landscape 1 : 1 to perhaps around 16 : 9 on iPhone X came to measure the brightness of the wallpaper as a whole regardless of "Still" or "Perspective".